* 2015 KBB.com 10 Best UberX Candidates * 2015 KBB.com 5-Year Cost to Own Awards * 2015 KBB.com 10 Tech-Savviest Cars Under $20,000 * 2015 KBB.com 10 Most Affordable Cars Call Egolf Brevard at 828-884-4151. You make the drive, well make the deal and youll feel like family! 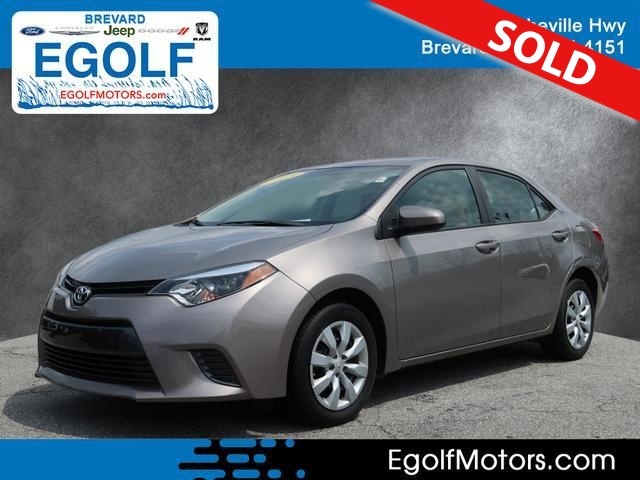 The 2015 Toyota Corolla isn't built to excite, but its sensible blend of fuel economy, features, versatility and value make it a compelling choice for typical small sedan shoppers. Following a full redesign last year, the 2015 Corolla adds a fold-down rear center armrest to all trim levels except the base L. The "Premium" sub-trims also receive the Driver Convenience package as standard. Copious rear legroom; impressive fuel economy; user-friendly controls; generous standard equipment; pleasant ride. If the 2015 Toyota Corolla was somehow competing on a reality TV show it'd probably be voted off in the first few rounds. It's just not an attention-grabbing kind of car. But for a majority of small sedan shoppers, having a car that avoids histrionics is exactly the point. If you're somebody who just wants to set it and forget it with a minimal amount of fuss, chances are you'll find plenty about the 2015 Corolla that's to your liking. Coming after a complete overhaul last year, the latest Corolla's restyled exterior won't exactly blow your hair back, but the fresh interior is a big step forward, bringing a newfound sense of style along with widely available niceties like a user-friendly touchscreen and automatic climate control. The backseat's cavernous legroom gives the compact Corolla near-midsize passenger space, while the continuously variable transmission (CVT) enables stellar fuel economy. Throw in the Corolla's pretty high crash test scores and its historically robust reliability and you've got pretty much everything most people need and want for a small sedan. Just keep in mind that if you value driver engagement, the Corolla remains one of the least inspiring options in this class. More dynamic alternatives include the sophisticated and similarly fuel-efficient 2015 Mazda 3 and the frugal yet fun-to-drive Ford Focus. Although the 2015 Hyundai Elantra lacks that sporty edge, it does offer ample style at an attractive price, and the always-popular Honda Civic and Volkswagen Jetta have been remade into strong all-around contenders. But considering its undeniable appeal for the money, this Toyota still earns a solid Edmunds.com "B" rating. Other small cars will steal the headlines, but don't let that distract you from the 2015 Corolla's fundamental competence. The 2015 Toyota Corolla is a five-passenger compact sedan available in four main trim levels: L, LE, LE Eco and S. All but the L are further offered in Plus and Premium sub-trims. Standard features on the base L model include 15-inch steel wheels, LED headlights (low beams only) and running lights, powered accessories, air-conditioning, a tilt-and-telescoping steering wheel with auxiliary controls, a height-adjustable driver seat, a 60/40-split-folding rear seat, Bluetooth phone connectivity and a four-speaker sound system with a CD player, a USB/iPod interface and an auxiliary audio jack. The LE adds 16-inch steel wheels, heated mirrors, variable intermittent wipers, keyless entry, metallic cabin accents, cruise control, automatic climate control, a rearview camera, a six-speaker sound system with a 6-inch touchscreen display, Bluetooth audio connectivity, phonebook download capability and voice controls. The LE Plus adds 16-inch alloy wheels, foglights, piano black interior accents and eligibility for both an optional sunroof and the Driver Convenience package, which includes the sunroof and adds keyless entry and ignition, a roof-mounted antenna (versus the standard in-glass antenna), satellite radio, HD radio, a navigation system and Entune App Suite mobile-app integration. Going with the LE Premium gets you the LE Plus model's standard and optional features plus a power driver seat, heated front seats and premium vinyl upholstery. The LE Eco starts with the LE's features and adds efficiency-maximizing engine and transmission tuning, 15-inch steel wheels with low-rolling-resistance tires, a rear spoiler and enhanced aerodynamics. The LE Eco Plus adds special 16-inch alloy wheels, foglights, chrome window trim, an Eco driving mode and the same options as the LE Plus. The LE Eco Premium shares the LE Premium's upgrades. Should you choose the sport-themed S trim you'll get the LE's features plus unique wheel covers, a chrome grille frame, foglights, color-keyed mirrors with signal repeaters, a rear spoiler, a chrome exhaust tip, sport front seats, a leather-wrapped steering wheel with paddle shifters, a Sport driving mode, sport instrumentation and a trip computer. You can upgrade the S trim with the S Plus that has 17-inch alloy wheels, firmer suspension tuning and rear disc brakes (versus the standard drums), and it's eligible for the sunroof and Driver Convenience package like the other Plus models. Notably, if you specify the six-speed manual transmission (offered only on S Plus), you don't get the shift paddles or Sport driving mode, but you do get the Driver Convenience package as standard. The S Premium starts with the S Plus' equipment and shares the upgrades of the other Premium models, including the premium vinyl upholstery. The 2015 Toyota Corolla is powered by a 1.8-liter four-cylinder engine that comes in two different versions. On every trim level except the LE Eco, it produces 132 horsepower and 128 pound-feet of torque. The LE Eco's more efficient version also makes a little more power, checking in at 140 hp and 126 lb-ft of torque. The base Corolla L comes standard with a six-speed manual transmission, offering a four-speed automatic as an option. The other trims feature a continuously variable transmission (CVT), though the S can also be ordered with the six-speed manual. In Edmunds performance testing, a Corolla LE Eco sauntered to 60 mph in 9.2 seconds, comparable to a CVT-equipped Honda Civic but nearly a full second behind the Ford Focus and Mazda 3. EPA-estimated fuel economy varies depending on which Corolla you choose. It checks in at 31 mpg combined (27 city/36 highway) with the four-speed automatic and also 31 mpg combined (28/37) with the six-speed manual. The CVT returns 32 mpg combined (29/38) in the LE and a comparable 32 mpg combined (29/37) in the S. The LE Eco leads the way at 35 mpg combined (30/42) in standard form and 34 mpg combined (30/40) in Plus or Premium form. Standard on every 2015 Toyota Corolla are stability and traction control, antilock brakes, front side airbags, side curtain airbags, a driver knee airbag and a passenger seat cushion airbag. A rearview camera is standard on all trims except the base L.
Note that most 2015 Corollas feature cheaper rear drum brakes, with only the S Plus and S Premium upgrading to rear discs. In Edmunds brake testing, a Corolla LE Eco with the rear drums stopped from 60 mph in 130 feet, a longer than average result. In government crash testing, the Corolla earned the top overall rating of five stars, including five stars for frontal impacts and five stars for side impacts. The independent Insurance Institute for Highway Safety awarded the Corolla its top rating of "Good" in the moderate-overlap frontal-offset, side-impact and roof-strength tests. In the small-overlap frontal-offset test, though, the Corolla received the second-lowest rating of "Marginal." Its seat/head restraint design was rated "Good" for whiplash protection in rear impacts. The current Corolla's cabin is easily the most interesting one to date, and yes, we realize that's not saying much. Still, it's clear that the designers were given freer rein this time, and the result is a reasonably stylish dashboard, accented by un-Corolla-like flourishes such as a sportily contoured steering wheel and an eye-catching asymmetrical shifter surround. The top priority remains ease of use, so the various audio interfaces employ tried-and-true knobs for volume and tuning, while the LE-and-up automatic climate-control panel (a welcome luxury in this price bracket) consists of a large knob and a few foolproof buttons. Another pleasant surprise is the 6.1-inch touchscreen interface, also standard on LE and above, which provides large virtual buttons and simple, clear graphics. The screen responds quickly to inputs, and its feature set is generous for an economy car offering. The available Entune App Suite integrates smartphone-connected services from Bing, Facebook, Yelp and Pandora, among others, as well as real-time traffic data and sports and stock information. Note that getting started with Entune can be a bit of a hassle, since you have to install an app on your phone and register for an account. The Corolla's front seats provide generally adequate comfort, particularly the S trim's better-bolstered chairs, though some may wish for more lumbar support. Also, longer-legged drivers could use more range from the telescoping steering wheel. Thanks in part to a 3.9-inch-longer wheelbase than the previous Corolla, the current car offers considerably more rear legroom than most small sedans, if not a commensurate amount of headroom. The middle rear position is made more hospitable by the nearly flat floor, which lacks the traditional center "hump." Trunk capacity is average at 13 cubic feet, but the wide opening facilitates loading and unloading. Despite last year's complete redesign, the 2015 Toyota Corolla delivers much the same driving experience as its predecessor. Partly, that's down to Toyota's tried-and-true but generally underwhelming 1.8-liter engine. Acceleration is adequate but nothing more. The LE Eco's version gets some tweaks that add a few horsepower, but we couldn't detect a difference. We do like the CVT, as it has computer-simulated "shifts" to mitigate the typical CVT's constant-rpm drone during acceleration. Skip the archaic four-speed automatic in the base L unless the price is simply too good to pass up. The Corolla's handling, too, is familiar. Sporty S-trim touches notwithstanding, there's no playfulness to be found here; instead, enthusiastic driving around turns is met with a lifeless steering feel and pronounced body roll. Instead, this car is all about no-hassle commuting comfort, with a quiet, compliant ride that makes the daily grind seem less onerous.